I am back today with Vivian (have you missed her?!) and three other stylish, beautifully-dressed ladies. 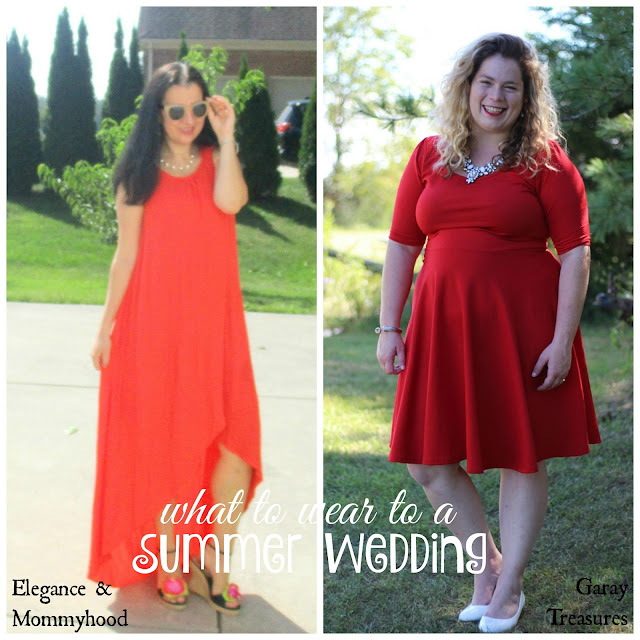 As a matter of fact RACHEL from Garay Treasures and our girls, are showing you what to wear to a Summer Wedding, you know since technically it is still Summer for 9 more days. In my case, this is what I wore to a Summer Outdoor/Back Yard Wedding. Over Labor Day weekend, the first Sunday of September, Vivian and I were invited to a last-minute planned wedding. The lady getting married is a former co-worker of mine and now practically a neighbor since her husband lives 3 blocks away. I have known her for about a decade and in many ways she has been a mother figure to me. I also know her mom and her two sons. This was a second wedding for both so the ceremony and dinner under a tent, took place in their home's back yard. 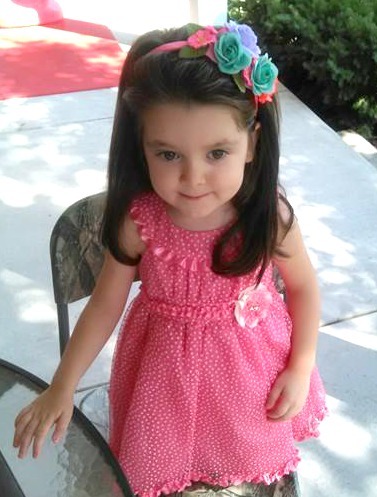 There were about 60 people there with 10 of those being children under 10 so Vivian had some friends to play. 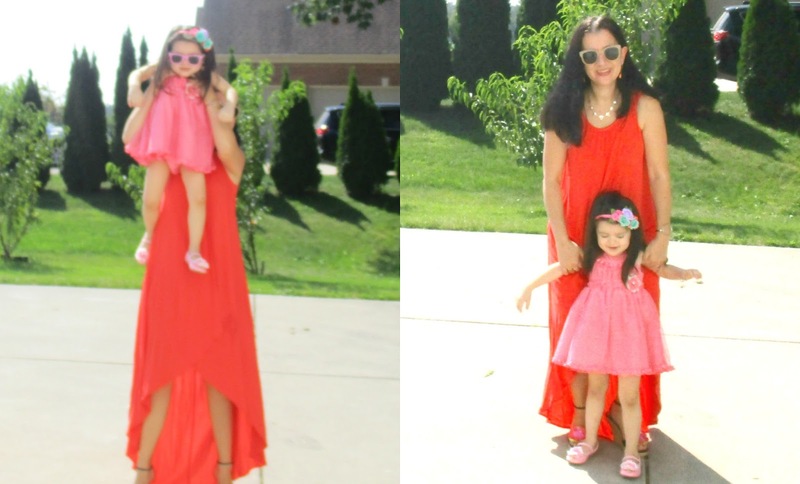 Vivian and I coordinated in shades of Coral: a Dressy Chiffon Polka Dot Midi Ballgown for her (which she chose herself) and a Neon Coral, (almost red) Tulip Hi-Lo Maxi Dress for me (which I previously wore in our St. Joseph Vacation). 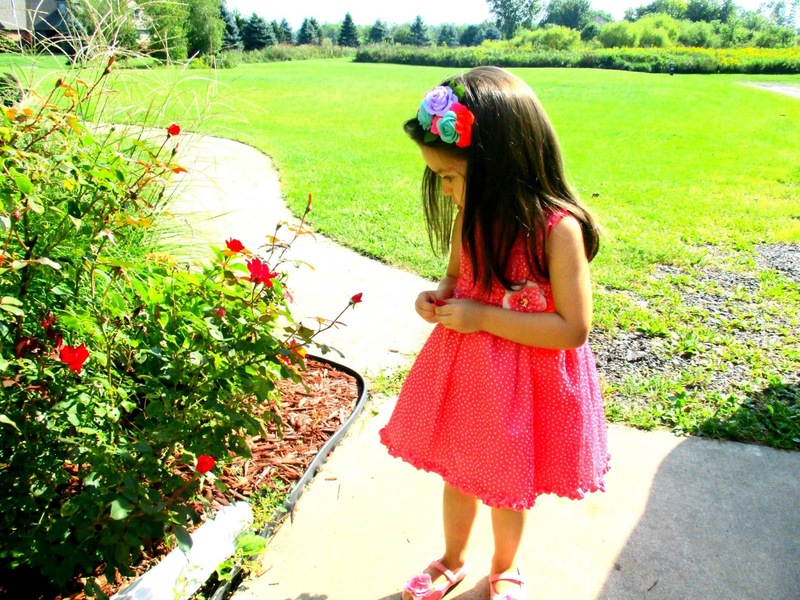 Vivian picked her multi-roses headband and even asked for her "beautiful pink flower shoes" - which is how she refers to these Ballet Flats from Target. 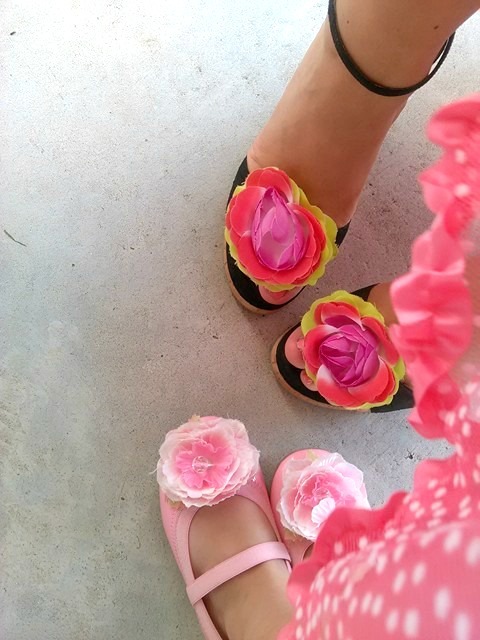 Though, I had already picked to wear my Black Wedges with Brightly Colored Roses, both Vivian and I couldn't help but love how our Ombre Roses looked together in our feet. We coordinated without planning to. (She kept saying "pretty feet"). Instead of a typical skinny clutch I carried this Quilted Black Bag (I hid the silver chain strap) since it is pretty deep so it carried my phone, some money, my ID, my mini Powershot camera, my E.L.F. 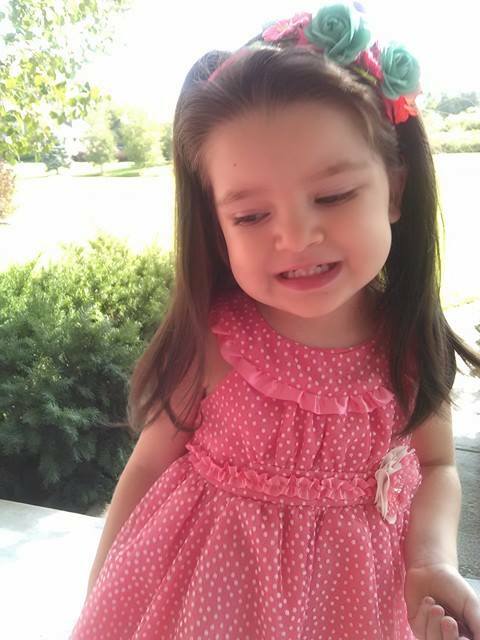 "Touch of Berry" Lipstick, some wet makeup/stain removers and a couple of gummy bear bags for Vivian. We weren't driving far after all. 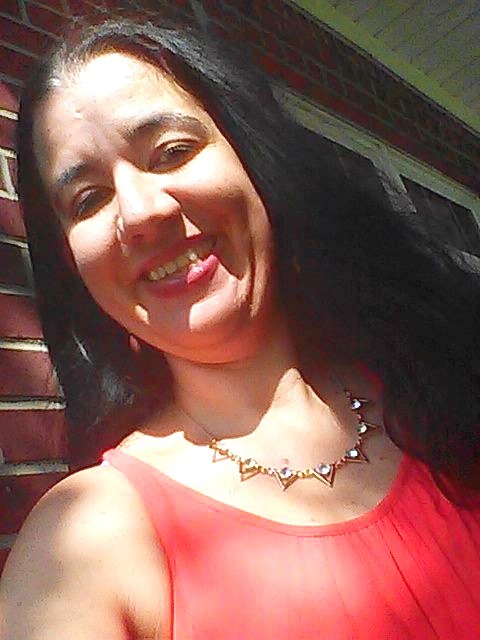 The necklace and earrings from the latest Rocksbox worked great. The necklace was bold yet dainty with mini circles that had cubic ziconia silver stones inside. The earrings are simple drop earrings with small oval-shaped multi-faceted coral stones. Both these pieces were gold-tone so all I did is add my closed circle gold-tone cuff and my semi-precious orange stone gold ring. It was too hot for a lot of heavy jewelry. We took some of the photos you see today on Sunday (prior to going to the wedding) and a few we had to take 2 days later. 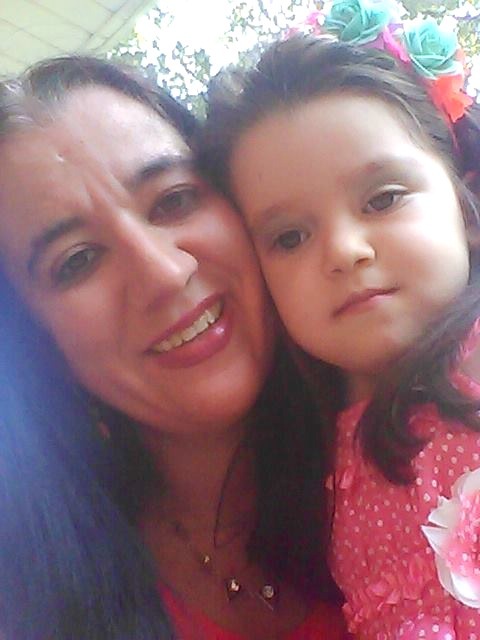 If you notice in some pictures Vivian has on a little bit of my lipstick and a little green eye-shadow (to copy mommy after seeing me do my makeup) and in some she doesn't. We did take pictures at the wedding (mostly with the couple) but our makeup and hair were pretty much disheveled because it was so hot. Both my hair and Vivian's went up in a bun minutes after we had arrived at the wedding. Anyway, I do apologize for the massive amount of photos in this post. 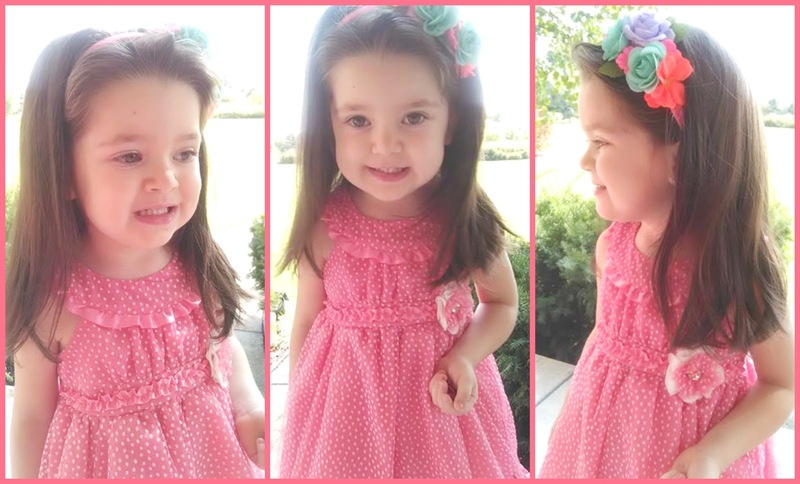 I took so many adorable ones of Vivi, these are only about half. 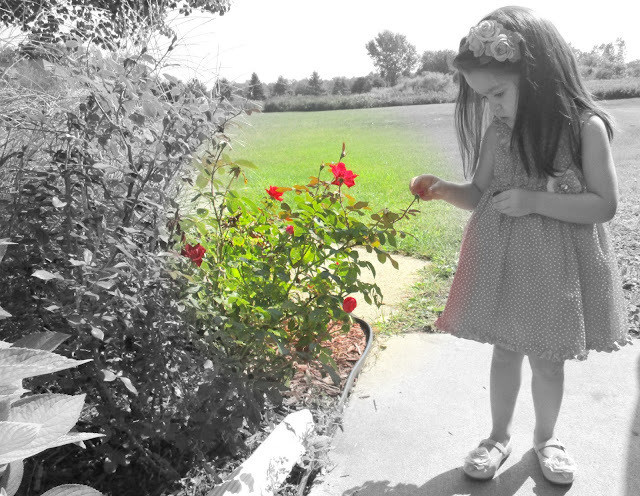 I had fun editing them too and for the first time I let my creative side use some of the very special and fun effects. 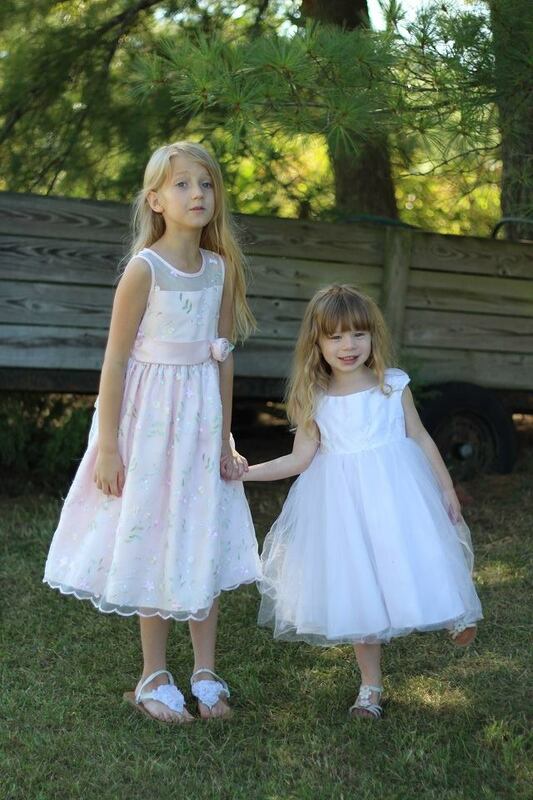 Rachel put her daughters Nevaeh and Elizabeth (who is Vivi's age) in Gorgeous Fancy Soft Blush Pink and White Satin Gowns with coordinating White Sandals. Surprisingly Rachel and I were both in Red. I love the fit+flare Classic Red Dress Rachel has on - it is timeless. It was wonderful working with Rachel on this collaboration after many we have already done together. 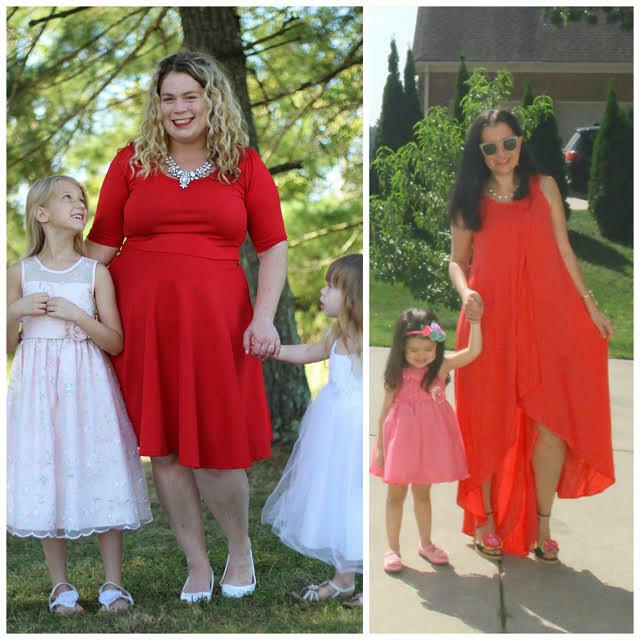 In two and a half years that we have been blogging friends, we did a "Babes on a Budget" series (joined by another blogger) where our head to toe outfits were $75 or less. And last Fall, Winter and Spring we have collaborated with a few other of our blogging friends in a "What to Wear to a Wedding" series. So today's post is so fitting. 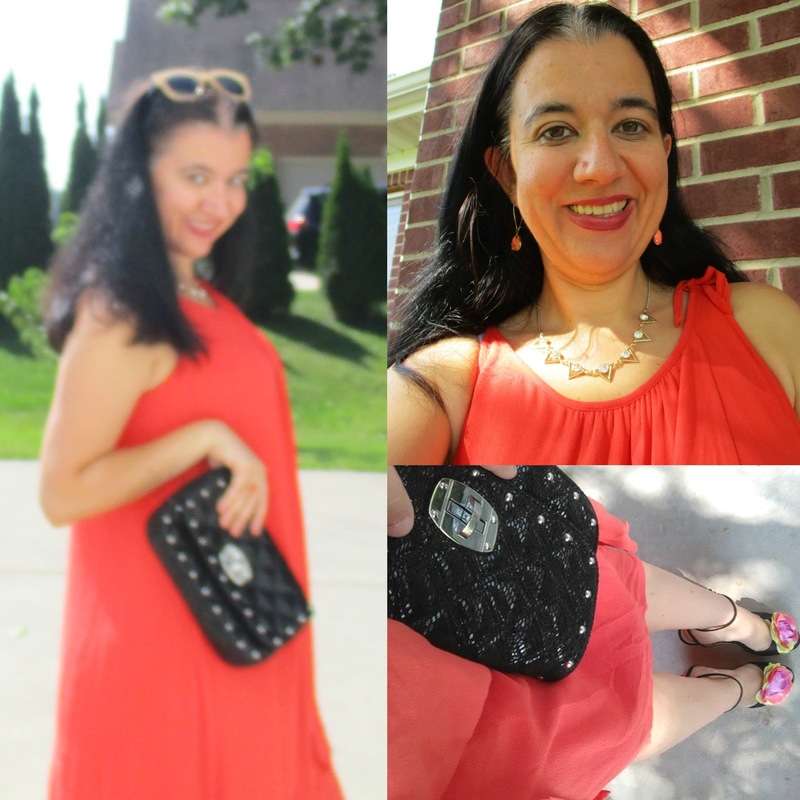 Read more of Rachel's post from today and join her amazing Tuesday Style linkup, here. ...And Rachel's Beautiful Girls Nevaeh and Elizabeth. Hi-Lo Bright Orange-Red, Tulip Maxi Dress: Merona via Target.com (New) (similar, Steal, love this), (similar patterned option, Fantastic Deal), (similar midi option, Great Deal), (similar, splurge). Taupe, Big-Framed Plastic Sunglasses: Loft (New) (similar, Steal, my Favorite), (similar, on Huge Sale, love these), (Similar, Splurge). Burgundy-Red, Satin Lipstick: Beautifully Bare Satin Lipstick by E.L.F. in "Touch of Berry" (New) (same in pink), (similar, Steal, love this), (similar, Great Deal, my Favorite). Teardrop-Shaped, Multi-faceted Coral Stone, Light Drop Earrings: "Dee" by Kendra Scott via Rocksbox (New) (identical), (similar, Steal), (similar, on Huge Sale, my Favorite). Crystal Points "Triangle", Gold-Tone Statement Necklace: Slate via Rockbox (New) (similar, Steal), (similar, Great Deal, my Favorite), (similar, Splurge, love this). Closed Circle, Gold-tone Cuff: Pitaya (Gifted by my sister-in-law; New) (very similar). Gold Wedding Band + Gold w/ Diamond Ring: Wedding Rings by my Husband. Gold-tone Ring w/ Semi Precious Square Orange Stone: Kohl's (similar, Great Deal, love this), (similar, my Favorite). Black Sandals w/ Natural Cork Wedges & 3-Colored Neon Roses: Chinese Laundry (Old) (similar, braided, Steal), (similar, on Sale, my Favorite), (similar in blush, Splurge). 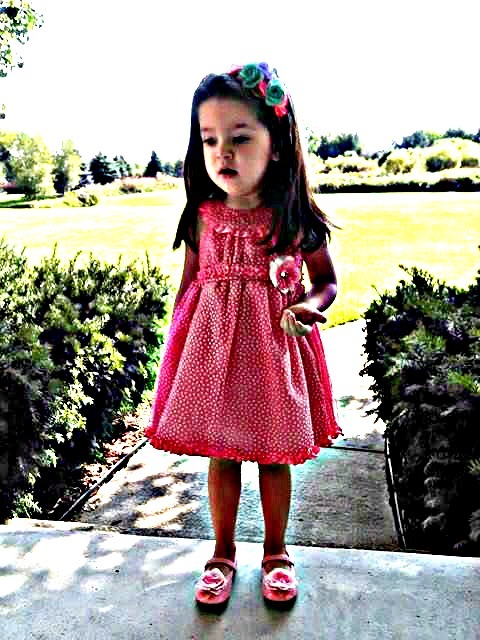 Coral Tulle Chiffon Midi Ballgown w/ White Polka Dots & Frilly Hem: c/o a Local Boutique (New). Coral Silk Headband w/ Multi-Colored, Different-Sized Roses: Target (New). Baby Pink Patent Leather Ballet Flats w/ Silk Ombre Roses: Target (New). Katherine, Leeanne, Lindsay and Megan, Lindsey, Liz, Madeline, Monica, Rebecca, Sarah with Mackenzie, Tania, Vicki and Victoria. A brand-new Thursday Moda will be live tomorrow night at 7.00 PM Eastern. Come join it!